The global heparin market is expected to become progressively competitive over the forthcoming years. This is due to the strengthening position of the leading market players in the global market for heparin. Several initiatives have been taken by the leading market players to retain their strong foothold over the market. Intensive research and development along with effective marketing hacks have been the key highlights of the business strategy of the leading market players. Furthermore, the market players have gained commendable revenues by dispelling their products through multiple distribution channels. It is anticipated that the top market players would keep recalibrating their approach to match the needs and trends of the market. An analysis of the regional market players reveals that these players are not present in huge numbers; in fact, only a handful of regional or local market players exist in the market. The entry of new players into the global market for heparin is inhibited by the strong position of the existing players. The leading market players are expected to capture the smaller players over the coming years. This would further fortify the position of the top market players and make the market increasingly consolidated. 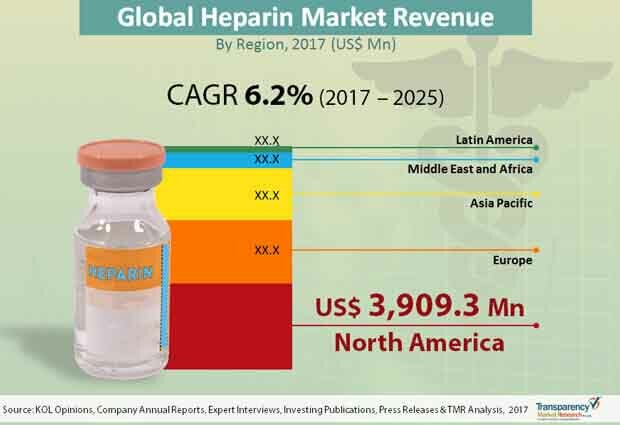 Some of the key players in the global market for heparin are Teva Pharmaceutical Industries Ltd., Dr. Reddy’s Laboratories Ltd., Fresenius SE & Co. KGaA, LEO Pharma A/S, Sanofi, Pfizer, Inc., Aspen, B. Braun Melsungen AG, Baxter International Inc., and Syntex S.A. The global market for heparin is expected to expand at a sturdy CAGR of 6.20% over the period between 2017 and 2025, finds Transparency Market Research (TMR). The global market was valued at US$10.1 bn in 2017 and is expected to accumulate revenues worth US$16.3 bn by 2025-end. The pharmaceutical industry has been growing at a starry rate over the past decade, and this has given an impetus to the growth of the global market for heparin. Heparin is most commonly used to treat coagulation of blood, and the rising incidence of such disorders could give an impetus to the global market. Furthermore, thromboembolic disorders have also become more common than a few years ago. This is also an important standpoint with regards to the growth of the global market for heparin. The food and drug administration (FDA) of the United States has also stipulated several regulations that have favored the growth of the global market for heparin. It is anticipated that the market for heparin would tread along a positive growth track due to the efforts of governments and the pharmaceutical industry. The global market for heparin is reaping benefits from the advancements in the pharmaceutical industry, but limited bioavailability of heparin is projected to hamper market growth. Furthermore, heparin is also believed to have side effects for humans, which is another hindrance to market growth. Protamine sulfate can be used as a substitute for heparin, thus, blocking the growth of the global market for heparin.